CHEYENNE, Wyo. 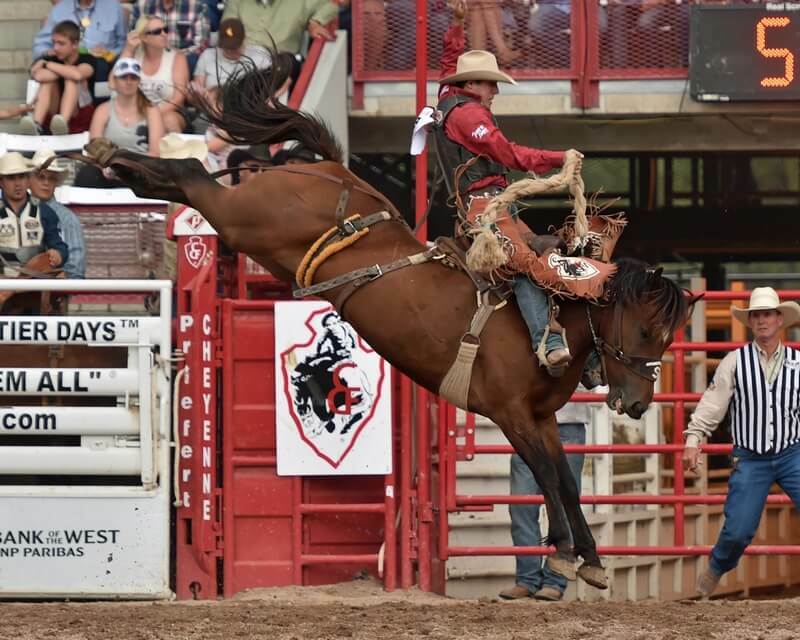 – July 25, 2018 – It’s only fitting that two local participants in the rodeo had success on Cheyenne/Laramie County Day on Wednesday at Cheyenne Frontier Days. A very enthusiastic crowd cheered for one of the favorites, Brody Cress, in the saddle bronc riding. The Hillsdale resident won the competition here last year. He graduated from Cheyenne Central High School where he was a wrestling stand out. Cress got on a horse owned by Stace Smith Pro Rodeo named Utopia and when the judges added up their scores, he had an 88 by his name. That is the highest score at the 122nd edition of the rodeo so far. He then packed up his gear and was making a mad dash out of Frontier Park. He was headed to Eagle, Colorado to ride Wednesday night, then back to Cheyenne for his second round of competition on Thursday. In the steer wrestling, it was Aaron Vosler, that had the stars align in his favor. Vosler stopped the clock in 5.7 seconds which is the fastest run of the rodeo so far. 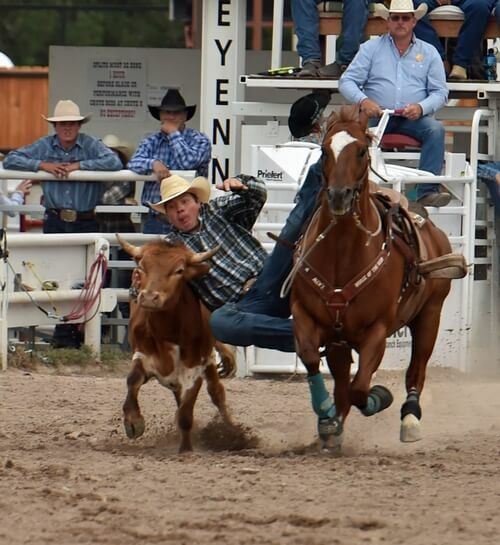 The steer wrestling is one of the most exciting events at Cheyenne. Steers get a 30-foot head start and when cowboys get to them, they are all running full on. Anything can happen and often does. Getting that steer slowed down, and then laying it on the ground takes skill, strength and patience. A 5.7-second run wouldn’t place at most rodeos, but it is just six-tenths off of the arena record in Frontier Park. Brittany Pozzi-Tonozzi is hoping for her second buckle from Cheyenne. She won the rodeo here in 2007 aboard her great gelding Stitch, then went on to win her first of two world titles. This year Pozzi-Tonozzi is riding an American Quarter Horse mare, Kiss Kiss Bang Bang that she calls Mona. They had a nearly flawless run in the big arena here stopping the clock in 17.61 seconds. She won almost $2,000 here in the first round with a time of 17.83. She now has command of the overall standings here with a total time of 35.44 seconds. Lacinda Rose from Willard, Missouri, is in second at 36.77. All of the competition at the sixth performance of the Cheyenne Frontier Days Rodeo will be in the second round. Competition gets underway at 12:45 p.m. There will be a lot of pink seen around the arena as well as inside of it as “Give Cancer the Boot” is the day’s theme. The following are current leaders from the 122th annual Cheyenne Frontier Days Rodeo after the fifth performance. Team Roping (first round) 1, Ty Bach, Mt. Vernon, Texas, and Trey Johnson, Weatherford, Texas, 7.0 seconds. 2, (tie) Paul David Tierney, Oklahoma City, Okla., and Tanner Braden, Dewey, Okla.; and Cody Callaway, Gillette, Wyo., and Clay Johnson, Rozet, Wyo., 8.0. 4, Jeff Flenniken, Caldwell, Idaho, and Jake Minor, Ellensburg, Wash., 8.3. 5, Levi Simpson, Ponoka, Alberta, and Jeremy Buhler, Arrowwood, Alberta, 8.4. 6, Chris Francis and Cade Passig, Las Vegas, N.M., 8.6. (second round) 1, Garrett Tonozzi, Fruita, Co., and Joe Mattern, Plantersville, Texas, 7.5 seconds. 2, Kellan Johnson and Jhett Johnson, Casper, Wyo., 7.6. 3, Trevor Brazile, Decatur, Texas, and Patrick Smith, Lipan, Texas, 7.7. 4, Derrick Begay, Seba Delkai, Ariz., and Cory Petska, Marana, Ariz., 8.5. 5, (tie) Kaleb Driggers, Hoboken, Ga., and Junior Nogueira, Presidente Prude, Brazil; Clint Gorrell, B, N.D., and Drew Gartner, Killdeer, N.D.; and Cole Dorenkamp, Lamar, Co., and T.J. Watts, Eads, Co., 8.6. 8, Jr. Dees, Aurora, S.D., and Cody Cowden, Atwater, Ca., 19.3 (overall leaders) 1, Francis and Passig, 17.5. 2, Bach and Johnson, 18.3. 3, White and Wakefield, 18.5. 4, Driggers and Nogueria, 18.6. 5, Begay and Petska, 18.7. 6, Chad Masters, Cedar Hill, Tenn., and Joseph Harrison, Overbrook, Okla. 7, Tyler Harris, Killdeer, N.D., and Ross Carson, Grassy Butte, N.D., 19.1. 8, Jr. Dees and Cody Cowden, 19.3.